In addition to displaying diagnostic information in tmux windows, Anaconda also generates several log files, which can be transferred from the installation system. These log files are described in Log Files Generated During the Installation, and directions for transferring them from the installation system are available in Transferring Log Files from the Installation System. Additionally, you can use the autostep --autoscreenshot command in a Kickstart file to capture and save each step of the installation automatically. See autostep (optional) - Go Through Every Screen for details. There are two alternatives to text mode which can both be used even if the installation system does not have a graphical display. You can either connect to the installation system using VNC and perform an interactive graphical installation remotely (see Installing Using VNC), or you can create a Kickstart file to perform the installation automatically (see Automating the Installation with Kickstart). To start a text mode installation, boot the installation with the inst.text boot option used either at the boot command line in the boot menu, or in your PXE server configuration. See Booting the Installation for information about booting and using boot options. 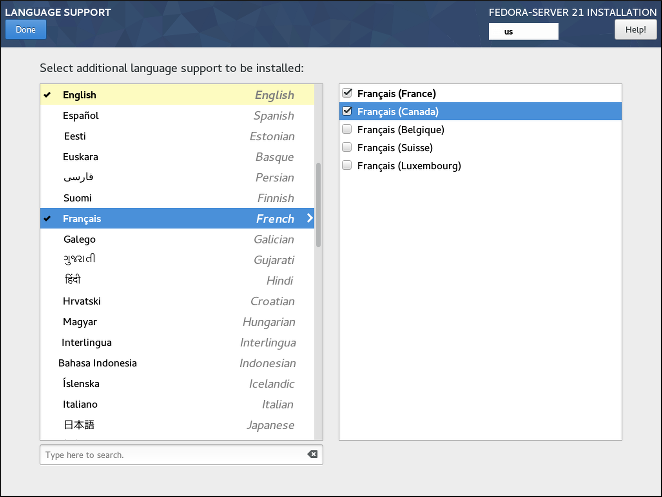 Enabling support for some languages (typically languages which use non-Latin script) will install additional packages - for example, enabling support for one or more languages from the Arabic group will also install the arabic-support package group. For more information about packages, see Software Selection. Normally, when you first enter the Installation Summary screen, the installer will attempt to configure an installation source based on the type of media you used to boot. The full Fedora Server DVD will configure the source as local media, the netinst ISO image will configure the closest network mirror, etc. This process takes some time, especially if the default source is a network mirror. If you plan to use a custom installation source, use the inst.askmethod boot option to skip the initial configuration; this will allow you to enter this screen immediately. See Specifying the Installation Source for information about boot options. You can also specify additional repositories in the Additional repositories section to gain access to more installation environments and software add-ons. 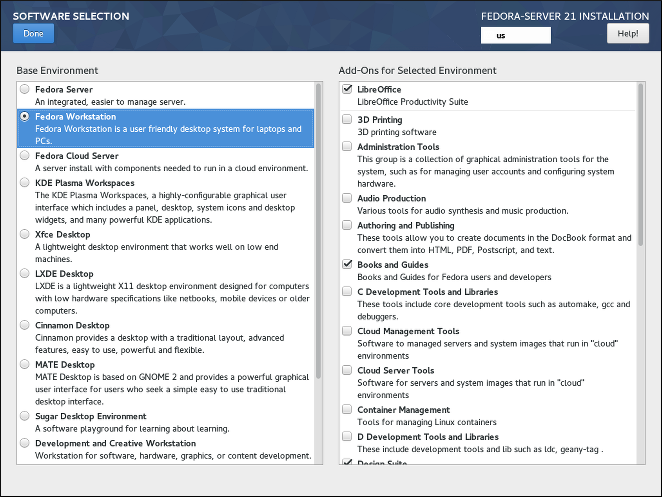 All environments and add-ons will be available for selection in Software Selection once you finish configuring the sources. It is not possible to select specific packages during a manual installation. You can only select pre-defined environments and add-ons. If you need to control exactly which packages are installed, you must use a Kickstart file and define the packages in the %packages section. See Automating the Installation with Kickstart for information about Kickstart installations. Environments and add-ons are defined using a comps.xml file in your installation source (for example, in the repodata/ directory on the full Fedora Server installation DVD). Review this file to see exactly which packages will be installed as part of a certain environment or add-on. For more information about the comps.xml file, see %packages (required) - Package Selection. 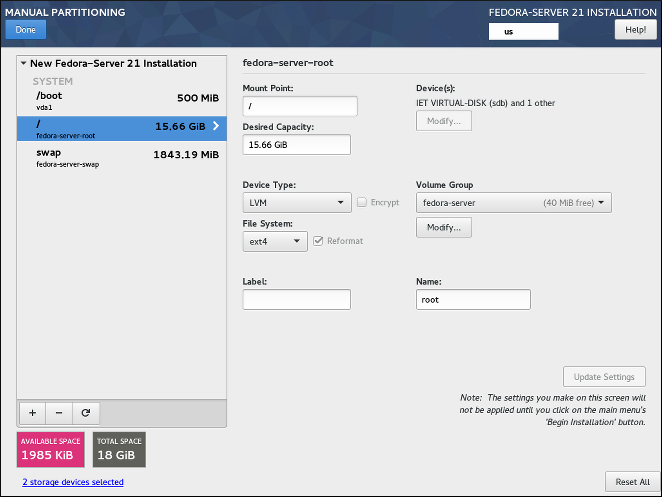 If you need to configure additional local storage devices, select I will configure partitioning and press Done to move to Installing_Using_Anaconda.adoc#sect-installation-gui-manual-partitioning. Then, connect any new hard drives you want to make available during the installation, and press the button marked by a circular arrow in the set of controls below the list of mount points on the left side of the screen. In the dialog window that opens, press Rescan Disks and wait until the scanning process completes. Then, press OK to return to Installation Destination; all detected disks including any new ones will be displayed in the Local Standard Disks section. The Specialized & Network Disks section below shows advanced network storage (such as iSCSI and FCoE disks) currently configured. When you first open this screen, no such devices will be displayed because they can not be automatically detected; to search for network storage devices, press Add a disk button and proceed with Installing_Using_Anaconda.adoc#sect-installation-gui-installation-destination. Any network storage you configure will then show up in the Specialized & Network Disks the same way local disks are shown above. Additionally, you can select Encrypt my data; this will encrypt all partitions except the ones needed to boot the system (such as /boot) using Linux Unified Key Setup (LUKS). Encrypting your hard drive is recommended. For detailed information about LUKS encryption, see the Fedora Security Guide, available at https://docs.fedoraproject.org/. If you lose the LUKS passphrase, any encrypted partitions and the data on them will become completely inaccessible. There is no way to recover a lost passphrase. However, if you perform a Kickstart installation, you can save encryption passphrases and create backup encryption passphrases during the installation. See Automating the Installation with Kickstart for information about Kickstart installations. To control which one of your selected storage devices will contain the boot loader, click the Full disk summary and bootloader link in the bottom left corner of the screen, and follow the instructions in Boot Loader Installation. Note that while in most cases it is sufficient to leave the boot loader in the default location, some configurations (for example, systems which require chain loading from another boot loader) will require the boot drive to be specified manually. 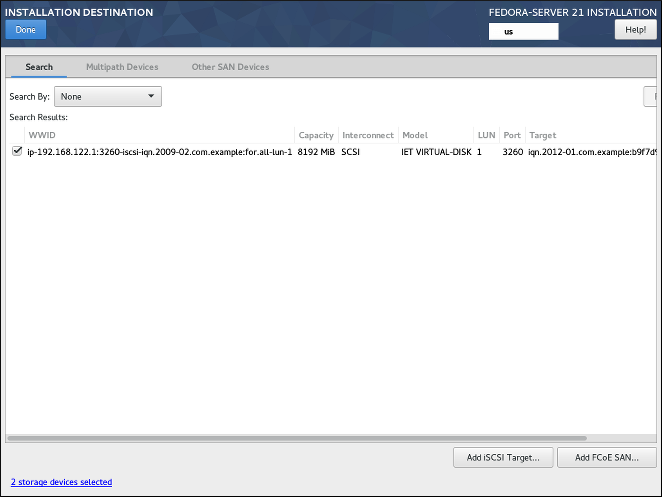 This part of the Installation Destination screen allows you to configure non-local storage devices, namely iSCSI and FCoE storage. This section will mostly be useful to advanced users who have a need for networked disks. For instructions on setting up local hard drives, see Installation Destination. In the list (regardless of how it is filtered), each device is presented on a separate row, with a check box to its left. Mark the check box to make the device available during the installation process; this will cause this device (node) to be shown in the Specialized & Network Disks section in Installation Destination. 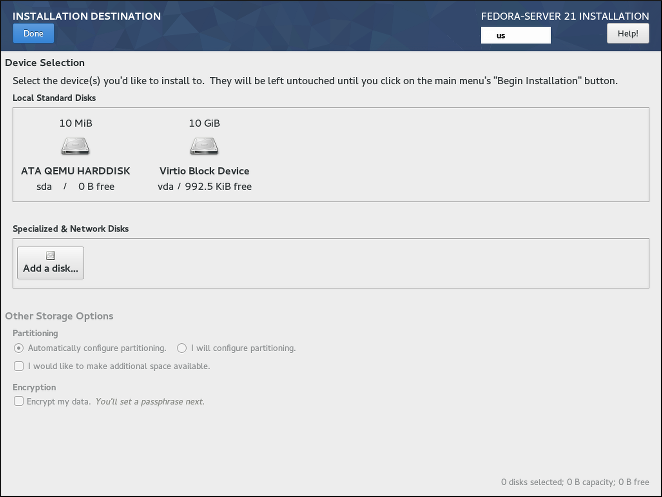 There, you can select the disk as an installation target and proceed with either manual or automatic partitioning. When you have selected the storage devices to make available during installation, click Done to return to Installation Destination. For more information about IQNs, see 3.2.6. iSCSI Names in RFC 3720 - Internet Small Computer Systems Interface (iSCSI), available from https://tools.ietf.org/html/rfc3720#section-3.2.6 and 1. iSCSI Names and Addresses in RFC 3721 - Internet Small Computer Systems Interface (iSCSI) Naming and Discovery, available from https://tools.ietf.org/html/rfc3721#section-1. Select the network interface (NIC) which is connected to your FCoE switch from the drop-down menu. Note that this network interface must be configured and connected - see Network & Hostname. When you first open the Manual Partitioning screen, the column on the left side will display all previously existing partitions on all drives which you selected as installation targers in Installation Destination. If none of the selected drives contain any existing partitions, then a message informing you that no mount points currently exist will appear. Click the X storage devices selected to view a summary of currently selected storage devices; this may help you with orientation in more complicated storage schemas. Devices displayed here are the ones you have selected in Installation Destination. If you want to add or remove any storage devices from your configuration, return to that screen and change your selection. To discard all changes, and to also detect any new drives which have not been detected when the installer started (usually when you attached a new drive after you started), press the button marked by a circular arrow in the set of controls below the list of mount points on the left side of the screen. In the dialog window that opens, press Rescan Disks and wait until the scanning process completes. Then, press OK to return to Installation Destination; all detected disks including any new ones will be displayed in the Local Standard Disks section. See An Introduction to Disk Partitions for additional information about the concepts behind physical partitions. See Understanding LVM for additional information about the concepts behind Logical Volume Management. You can also make sure that the volume group is encrypted by selecting the Encrypt option; this will enable LUKS encryption for the entire volume group. See the Fedora Security Guide, available at https://docs.fedoraproject.org/, for information about LUKS disk encryption. You can also make sure that the volume is encrypted by selecting the Encrypt option; this will enable LUKS encryption for the entire volume. See the Fedora Security Guide, available at https://docs.fedoraproject.org/, for information about LUKS disk encryption. Standard Partition - A standard partition can contain a file system or swap space. Standard partitions are most commonly used for /boot and the BIOS Boot and EFI System partitions. LVM logical volumes or Btrfs subvolumes are recommended for most other uses. See An Introduction to Disk Partitions for additional information about the concepts behind physical partitions. LVM - Choosing LVM as the Device Type creates an LVM logical volume and a volume group to contain it (unless one already exists, in which case the new volume is assigned to the existing group). LVM can improve performance when using physical disks and allows you to use multiple disks for a single mount point. For information on how to create a logical volume, see Installing_Using_Anaconda.adoc#sect-installation-gui-manual-partitioning-lvm. Also see Understanding LVM for some additional information about LVM in general. You can force the installer to use GPT on disks smaller than 2 TB by using the inst.gpt boot option as described in Boot Options. However, the opposite is not possible - you can not use MBR on disks larger than 2 TB. 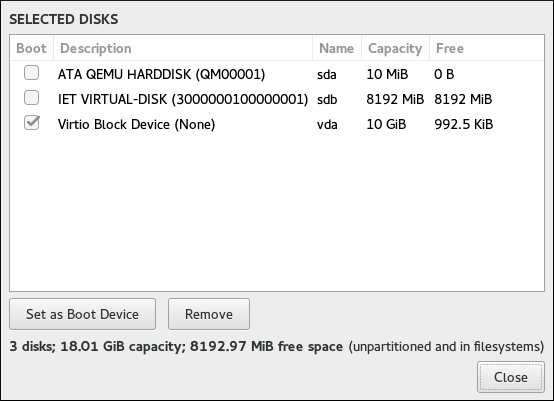 If you are not sure how best to configure the partitions for your computer, accept the automatic default partition layout provided by the installation program as described in Installation Destination. If you are new to Linux, consider reviewing the Linux Filesystem Hierarchy Standard at https://refspecs.linuxfoundation.org/FHS_2.3/fhs-2.3.html for information about various system directories and their contents. This screen is disabled by default. To enable it during the installation, you must use the inst.kdump_addon=on option at the boot menu. 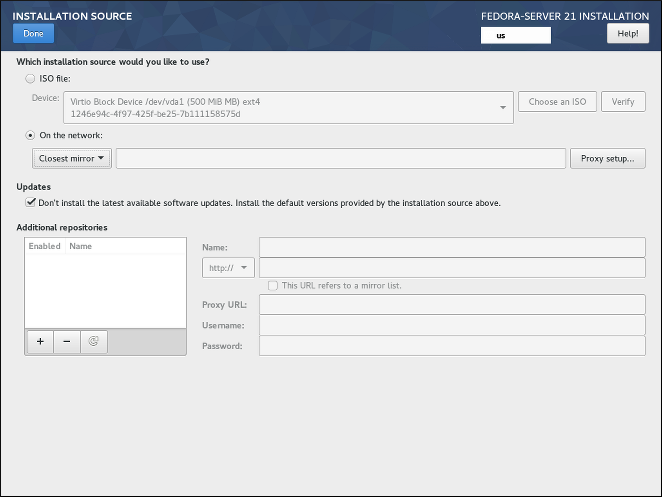 See Advanced Installation Options for details, and The Boot Menu for instructions on using custom boot options. Network configuration is an expansive topic and many of the options available during the installation are beyond the scope of this document. For detailed information about networking, including both theoretical topics and specific instructions and examples, see the Fedora Networking Guide, available at https://docs.fedoraproject.org/. Below the list of interfaces are two buttons. Use the + button to add a virtual network interface (Team, Bond or VLAN) as described in Adding a Virtual Network Interface. To remove a previously created virtual interface, select it in the list and click the - button. To change settings such as IP addresses, DNS servers, or routing configuration for an existing interface (both virtual and physical), select the interface in the left pane and click Configure in the bottom right corner of the screen. 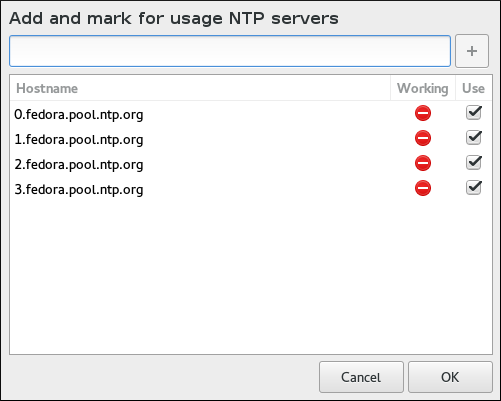 Available settings are described in Editing Network Interface Configuration. Select the interface type you want to add, and click Add. Another dialog window will open, allowing you to edit any available settings for your chosen interface type. 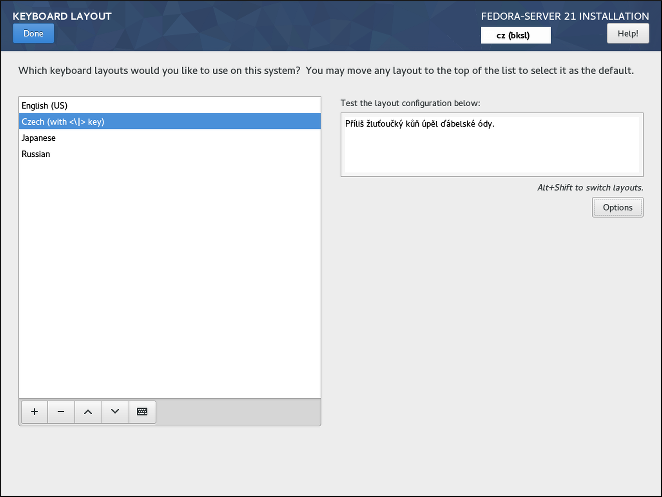 For information about available settings, see the respective sections of the Fedora Networking Guide, available at https://docs.fedoraproject.org/. Basic documentation is also available in Editing Network Interface Configuration. This section only details the most important settings for a typical wired connection used during installation. Many of the available options do not have to be changed in most installation scenarios and are not carried over to the installed system. Configuration of other types of networks is broadly similar, although the specific configuration parameters may be different. 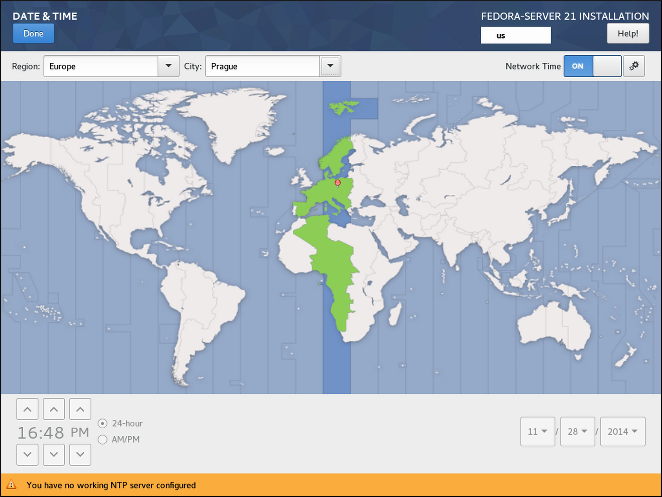 To learn more about network configuration after installation, see the Fedora Networking Guide, available at https://docs.fedoraproject.org/. 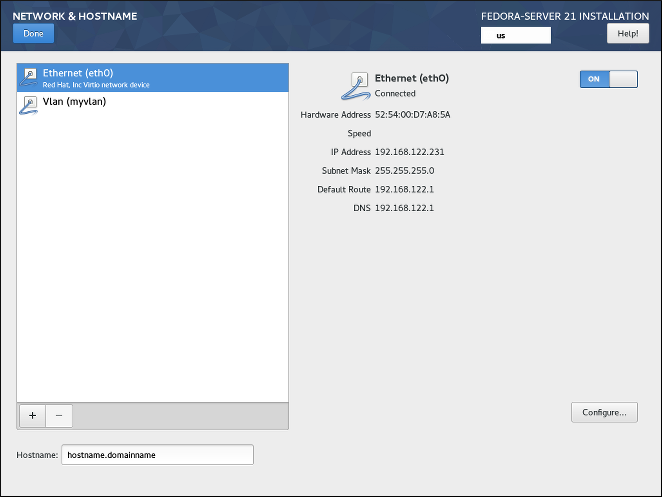 To configure a network connection manually, select that connection in the list on the left side of the screen, and click the Configure button. A dialog will appear that allows you to configure the selected connection. The configuration options presented depends on the connection type - the available options will be slightly different depending on whether it is a physical interface (wired or wireless network interface controller) or a virtual interface (Bond, Team or Vlan) which you previously configured in Adding a Virtual Network Interface.. A full description of all configuration settings for all connection types is beyond the scope of this document; see the Networking Guide for details. Once you finish configuring the interface, click Save in the configuration window’s bottom right corner to save your settings and return to Network & Hostname. The root account has complete control over the system. If an unauthorized person gains access to this account, they can access or delete all users' personal files or otherwise exploit the machine for their own nefarious purposes. See the Fedora Security Guide, available at https://docs.fedoraproject.org/, for detailed documentation about account security and guidelines for choosing a strong password. 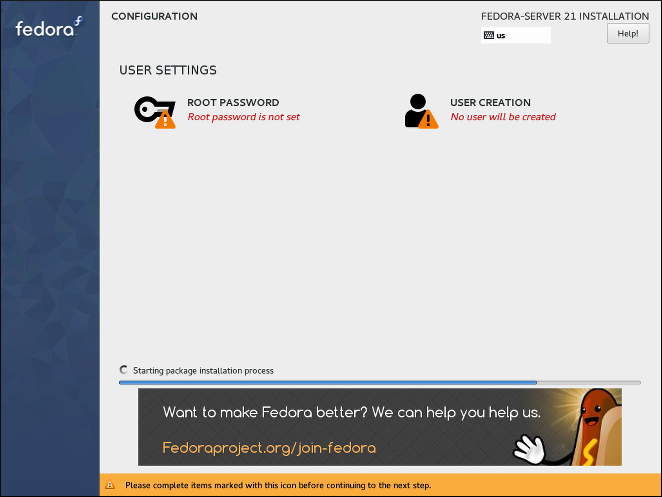 See the Fedora Security Guide, available at the https://docs.fedoraproject.org/, for detailed information about password security including guidelines for selecting strong passwords.